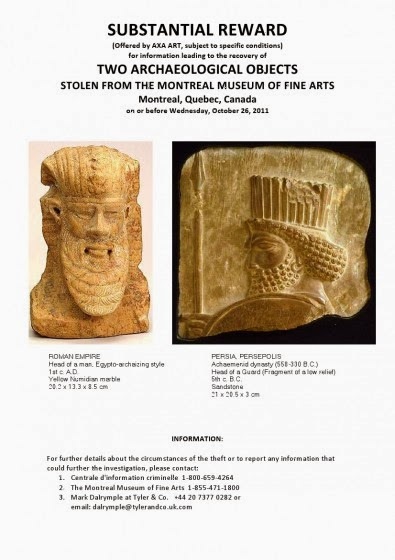 World Archeology: Stolen artifact from Montreal museum recovered in Edmonton. Stolen artifact from Montreal museum recovered in Edmonton. Quebec provincial police have found an ancient artifact in Edmonton after it was stolen in broad daylight from the Montreal Museum of Fine Arts. Police have been searching for more than two years for two pieces of art, which were stolen from the museum in September 2011. Investigators said they believe a man slipped the antiquities into his pockets and slipped outside. 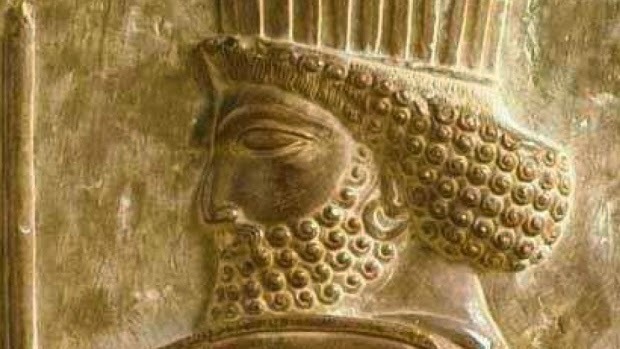 The recovered artifact — a fragment from a fifth century BC Persian bas-relief — was found in an Edmonton home on Jan. 22 when officers from the Sûreté du Québec/RCMP Integrated Art Crime Investigation Team and the Alberta RCMP carried out a search warrant. Police in Quebec say that a tip led them to the home last month. Sgt. Joyce Kemp from the Quebec Provincial Police said investigators believe the artifact was purchased for much less than its value. "I cannot give you details to how it was purchased because the investigation is still ongoing it might interfere with the next steps of the investigation," she said. "I cannot give you the exact number but it's worth $1.2 million and clearly the person paid much less than the value of the artifact." Simon Metke, 33, is charged with possessing stolen property over $5,000, possessing a controlled substance for the purpose of trafficking and possessing the proceeds of crime. Metke told CBC News he bought the piece for $1,400 from a "friend of a friend" while on a trip to Montreal. 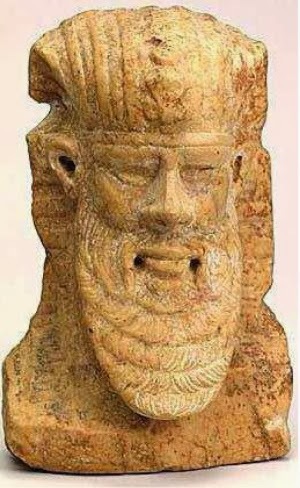 "I thought this thing was an interesting replica or some kind of Mesopotamia look-a-like souvenir-type thing." In December 2011, two months after the artifact was stolen, CBC interviewed Metke on a separate story. Caught on video in behind Metke, is the artifact. "I admired the craftsmanship of it," he told CBC Thursday. "It symbolized part of my spiritual journey to me." Metke's 26-year-old girlfriend is also charged with possessing the proceeds of crime and possessing a controlled substance for the purpose of trafficking. Police are still searching for the second stolen artifact, a Roman marble statue of a head, dating back to the first century BC. The two pieces were not in glass cases, but they were securely anchored to their displays, and investigators said they are not sure how the thief managed to take off with the antiquities. On security footage, a suspect is seen strolling through the museum wearing jeans, a dark jacket and a baseball cap. Anyone with information is asked to contact the SQ at 1-800-659-4264 or email art.alert@surete.qc.ca. The museum's insurance company has been offering what it calls a "substantial reward" for information leading to the recovery of the pieces.